I guess you have to start a story at the beginning. 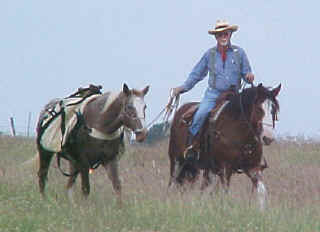 So, in the beginning I opined on a horse message board that while I knew nothing about ranching or riding horses on public lands, I did know that a lot of the ranchers and horse riders where I live don’t understand how it is fair for private folks to rent grazing rights from the government for $1.50 per AUM and we as horse folk were only allowed to ride public lands in specific areas. It sure hit a raw nerve and a few folks told me how ignorant I am. That was no news to me because I plainly stated I did not understand the phenomenon. There was one reply to my post though that was quite a bit different. It was from a professional ranch manager/cowboy/NH devotee who replied with not only some understanding that I was not attacking anybody but just stating that I, nor the people associate with, understand the concept. Here is Texas there are no public lands that are rented to local ranchers. Oh, perhaps in a National forest over in East Texas, but you can’t run enough cows there to fill a good sized gooseneck trailer. Duane Coombs (aka Fred Coombstone), replied that perhaps all was not as it may seem to me and that perhaps I should come and just see for myself. Well, I took that to be a ‘Put up or shut up.’ Challenge so I decided to just go and see for myself and I replied with one sentence, ‘Do I bring my saddle?’! Anyway, things went on, and on August 21, 2003 I got on the airplane and headed to Reno, Nevada, via Phoenix. On arriving in Reno I rented a car and lit a shuck for Fallon, NV where I turned off of the main road and drove in a most welcomed rain to the Smith Creek Ranch where Duane Coombs lives with his cute little barrel racing wife Heather, a pack of border collies, a cavvy of horses, a cowboy or two and greets each day to scenery that will take your breath. This is high mountain desert country. The flat desert is huge, and the mountains are bigger yet. They even have a playa lake there that is bigger than most of the lakes that are used for supplying Dallas or Ft. Worth with water. The only thing is that this lake has no water in it. You won’t believe it until you go down to it but it is as dry as a powder house and flat as a griddle. Duane even says it is designated as an emergency landing site for the space shuttle. Trees are at a premium in this part of the world. They have a few junipers and some pinyon pines but no big timber trees and not much of anything that makes good scenery or a good shade until you get up in the canyons. The ranch headquarters must be 12 to 15 miles from a paved road and that is not real strange to me but the mail box is on the paved road. On most of the ranches I am familiar with it is sort of customary to ride horses up to the mail box to fetch the mail in the course of a days cowboy riding. Couldn’t do that at the Smith Creek Ranch. The SCR is a working cattle ranch. They run pretty much commercial cattle and the cattle are on range 12 months of the year. Very little supplemental feeding is done on the ranch I am told. I can see why, if you got all their cattle assembled at one time the land is so fragile the cows would destroy it to the point it would be the next ice age before the desert could recover. SCR just doesn’t have much in warm weather grasses. After all this desert and getting only 6” of rain a year not much warm weather grasses can’t survive in that environment. The cool season grasses mature and provide standing forage for summer grazing. This and the grasses in the canyons where there is a supply of spring water and some forbs seem to provide for the cattle pretty well. SCR doesn’t produce a calf ready for the feed lot, they are happy to send a 400 lb. calf to Fallon, NV where it is preconditioned on alfalfa and corn silage prior to going to the feed lot. Seems pretty efficient to me though I don’t understand harvesting forage to be fed to cattle since my ranch is devoted to send the same kind of cattle SCR produces out to harvest growing forages and being preconditioned on pasture. I really worried about riding the SCR horses since Duane had told me many of their horses were ‘straight up’ bridle horses and they rode with spade bits. I just couldn’t imagine putting something like that in a horses mouth. The reality of the matter though is that my mount was soft, slow and yielding and I rode the 2 days and only took the slack out of one rein one time in the 2 days of riding. While some may think I am prone to use poetic license and exaggerate at times, Duane put me on a QH that was tall as a giraffe and weighed at least 1,400 lb. That big Dunn dude could sure push and pull that big body around some mighty tight places and would jump a little ditch or stream and give you a better ride than when he would trot. Heck that old boy even went into a pace with me. I didn’t know what in the world he was doing. I had never in my 63 years ever ridden a horse that paced but this QH not only could, he could do it well. On one of our rides we drove through the desert a while and continued to the foot of the mountains where we unloaded our horses and began a ride back into the mountains. Most of their cows are bred and when that event takes place in a multi bull herd, it seems there is always a bull or two that goes off by himself and just lays around and pretty much stays by himself. In my experience it is pretty much futile to try to do anything with them. After they have meditated a while or whatever, they will either start to roam again or come to the headquarters. I don’t guess that is possible though when you have quarter of a million acres to see after and Duane wanted his bachelor bulls to rejoin the herd. We rode up through one little canyon that didn’t seem to me could carry much water and I guess it can’t but I swear when it opened up into the mountains you could stand on a little rise and see 10,000 acres of pasture land on the side of those mountains. Every drop of water that fell on those mountains either soaked in or ran out in that little bitty canyon. It was sure deep but not at all wide and there was no sign of any active erosion so it is evident to me that water just doesn’t run down it much. Duane was wanting his cows to stay out of the canyons and up on the mountains to harvest that grass before they came down for the winter where they would spend the winter. It is quite a site to see that much land and little bunches of cows spread out on the side of a mountain. The cows were pretty much in small bunches of 10 to 15 in a bunch. The cows were all healthy but not quite as fat as we try to keep cows here in the Heart of Texas. Of course our guys try to wean a calf somewhere around 650 lb. and this country just couldn’t provide enough energy to do that with the cows having to walk so far each in the course of grazing. The temperatures on SCR were wonderful for this Texas cowboy who left his car parked in 100+ degrees of heat to go where it barely got to the 80’s. I love to wear a vest and it felt mighty good to have one on in August. The mornings and evenings were brisk. I guess my final summary of the situation is that there is no way in heaven or hell I would turn anything loose in that much country and try to find it once I thought it might have a calf big enough to sell. The environment there is awfully fragile but from my limited knowledge of desert agriculture, I would say the folks at SCR were doing a good job and being good stewards of Uncle Sam’s land. They are leaving a healthy amount of stubble and the grasslands have enough trash on them to give some protection. Years over grazing is not producing nearly as much problems for them as it is for folks I see and know on a daily basis. I guess the main thing that was evident to me was that if the grazing of government land was no longer permitted, the local economy would suffer as cowboys, ranch managers spend about all the money they coax out of that country. They buy a lot of fuel, trucks and other supplies in an area where there aren’t many people any way. There are a few old ‘desert rats’ out there too. They are the folks that just seem to be out there. No particular reason, they just live there because they like to live in the desert. I stopped at one of their watering holes I guess. I, at 63, was the youngest person in there other than the gal tending bar and waiting tables. Quite a place I’d bet and I would have spent some time there if I had had more time. I even saw one of Nevada’s legal brothel’s there. Now that is a place that I would not spend ANY time, money or any thing else. I think it was called Salt Wells and I can tell you any gal that would work there and any guy that would be a customer would have to be tough. It made me itch just driving by on the highway. The one and only thing I regret about my trip is that my senses were so bombarded with so much information and so many things that were new and different to me, I did not write any poetry on the trip. Boredom seems to put my poetic juices to flowing and I simply didn’t have any time to be bored. A big thanks to Duane Coombs, (aka Fred Coombstone) the SCR and staff and the ttlt board for making this trip possible for me. It was a wonderful adventure. I for one, no longer feel these guys grazing public lands are getting a free ride. If my operation never makes a dime, I will still profit from the increase in the value of the land. These public lands ranchers simply must make a profit or perish. I don’t see how they can under present weather conditions but they are sure out there trying.